Rent your own villa with a staff to take care of your every need. No cleaning, no grocery shopping, no laundry, you can just enjoy a beautiful, 4000 square foot, Mexican villa overlooking the Bay of Banderas and Puerto Vallarta. 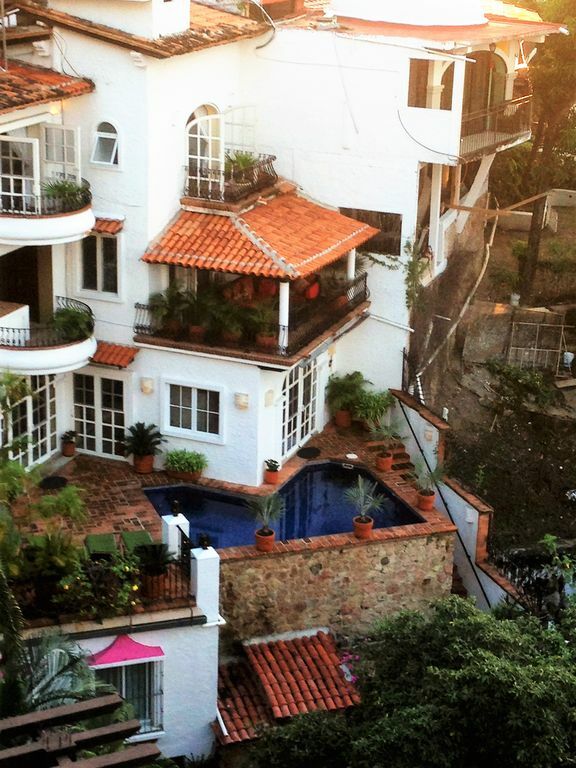 The villa is located on the south-side of Puerto Vallarta about a 15 minute walk to Los Muertos Beach. Tasteful furnishings grace the entire home on three floors. The first floor is the location of the living room, dining room, and kitchen. French doors open onto the terrace with a private heated (November through March) swimming pool. This is a private pool for the villa and not shared. The home has gone 'green.' There are solar electric panels and solar water heater to help provide some of the electricity and most of the hot water. House has purified water system, no need to buy bottled water. A large circular staircase with stained glass windows leads you to the second and third floors. The master suite occupies the entire second floor with a bedroom, closet, and fantastic bathroom with an open air jacuzzi. It has a king-size bed. The third floor has two bedrooms with private baths. One bedroom has two double beds and the other has a queen bed. The fourth bedroom is under the pool area and has its own separate private entrance. There are two twin beds there which can be made into a king sized bed. There are flat screen Smart TVs or smart DVD player in the living room and all the bedrooms so you can watch Netflix. Izzi is the local cable provider. Telmex wireless WIFI throughout the property. Free phone calls to the United States and Canada. VOIP phone so people can call you free of charge from the States. Bring the kids and grandkids. There is a high chair and playpen available for use. You can rent a stroller and other baby equipment here in Puerto Vallarta so you don't have to bring it with you. Please ask about it. The villa has a maid and a chef. They will pamper you and create a truly relaxing vacation. You will be freed of cooking, cleaning, and laundry. You can pack a little lighter since you will have your personal laundry done. You can select from the Villa Rosa menu for up to two meals per day. Or just tell Carlos what you would like to have. Carlos and Vanessa will do the shopping for you once you give them money. It is truly a carefree way of vacationing. Villa Rosa's concierge or Carlos can arrange for airport transport, birthday cakes, flowers, tour reservations, mariachi bands, or anything else you would like to have. To further enhance your experience 'spa services' in Villa Rosa are available at an additional charge. This is for both men and women. Massages, hair styling, haircuts, pedicures, manicures, and facials are available at a reasonable charge. This may be arranged in advance or when you arrive. Also, if you require, meet and greet services at the airport are available. A person will meet you at the airport, give you a brief orientation to Puerto Vallarta and take you directly to Villa Rosa. The charge is $50.00 for up to two people and $10.00 per extra person. When you depart you will be picked up at Villa Rosa and taken to the airport. Should you like to book tours or have someone make restaurant reservations for you, a tour guide is available to assist you. The goal is to make your visit something you will remember. There is a 5 night minimum from December 22 through January 2. The rental agreement is contained in the information that is on the web site when you book as an attachment. By booking you agree to the terms of the rental agreement. Property Manager that fell in love with Puerto Vallarta about 15 years ago. Found this beautiful house and love it. This property has it all. It is close to town, has a heated pool, 4 bedrooms and 4.5 baths, perfect for a family or group. The staff is fantastic. I love standing in the pool and looking out over the city. It is just heaven on earth to stand in the pool with your favorite beverage and look out over the city. The views from the villa are great. Original artwork in each room. Carlos and Vanessa make you feel at home. Overlooking the city with great views of the bay and mountains. High above the bay with a great view of the bay and city. Free calls the the United States and Canada. High efficiency mini splits in all the bedrooms which are very quiet. Air conditioning on main floor. Maid does personal laundry which is included in rental rate. Three of the bedrooms have balconies with wonderful views of the ocean. The master bedroom has seating for 5 people to enjoy cocktails watching the sun set on its terrace. The services of a chef are included in the rental rate. You pay for the groceries based on what you select to eat from the Villa Rosa menu or what you would like to have prepared. Carlos prepares wonderful meals that guests rave about. The property is picturesque and a great place to relax while in PV. Its in great shape- minor maintenance issues were immediately addressed. Vanessa and Carlos are welcoming, accommodating and terrific! Food was amazing! Stairs are common in PV and Villa Rosa is no exception- a walk to town is leisurely, but coming back is steep and the $4 taxi ride became a lot more popular as the week went by. saying how wonderful Carlos and Vanessa are, but they are. The pool was in the shad all day during the time of year we visited but we found it extremely comfortable at the beach chairs at la Palapas restaurant. Thanks os much, we are ready to come back now! Thank you. I am glad you had a great time. Loved our stay here, and Carlos and Vanessa are wonderful! The location makes for an easy walk downtown or you can Uber almost anywhere in the city for under $6US. The home was immaculate and the pool was so nice for the warm days. We will definitely be back! Thank you for your comments. Come on back. I traveled to Peurto Vallarta to celebrate my birthday with 7 close friends. From beginning to end, our stay was easy, carefree and fun! Angel was at the home to greet us and was instrumental in booking an excursion for us. Vanessa and Juan Carlos did an amazing job with grocery shopping, cooking and cleaning the home during our stay. The meals were always filling and there was more than enough to go around. The villa itself is large and the rooms are comfortable and always immaculately clean. My only complaint is that the 4th bedroom isn't in the main house, which made one our guests feel a little isolated. Overall, I would not hesitate to book this home again! Because of the beautiful vlla, great staff, amazing friends and the beautiful city, my birthday trip to PVR has been one of my favorite birthdays thus far! Amazing home with exceptional service and amenities. Would highly recommend. Overall, the house was exactly as listed and described. Location of home was in a quiet, yet convenient area of town. Vanessa and Carlos provided exceptional service and made our stay even more memorable. Having maid service and a cook available during our stay made for a truly relaxing and memorable vacation. We arrived home feeling relaxed and rested and not having laundry to do was an added plus! Pool was a welcome respite from the hot July heat and there were always plenty of towels. Air conditioning was also a welcome benefit and being able to adjust the temp in each room was ideal for everyone’s own preference. There were A LOT of stairs; 2 bedrooms were on 3rd floor, walk from garage to house was 2 flights of stairs, and the walk down to the main street was steep. Biggest surprise was 4th bedroom was completely separate from the main house, on the ground level off the garage. We didn’t feel comfortable having our two boys down there alone and isolated so we were unable to use this space but Vanessa helped us accommodate our sons elsewhere in the home. As was mentioned in previous reviews, there is a condo being built nearby and there is construction noise throughout the day. Beds were very comfortable and the overall appearance and upkeep of the home was on point. Our family appreciated the privacy the multi-level home provided as there were opportunities for everyone to do a variety of activities at once (swimming, watching movies, napping, playing board games, etc.). The owner and property management were always available and responded quickly to inquiries. Lots of communication prior to the trip helped us make plans prior to our arrival. Vanessa was always discrete and efficient when cleaning the rooms and did our laundry every day. Carlos prepared amazing meals and accommodated our picky son’s dietary requests very easily. Overall, all of our party was extremely impressed with our stay at Villa Rosa and hope to be able to return soon! Thank you for your review. I checked my description of the property on the listing and it does say that the fourth bedroom is under the pool and has its own private entrance. I am sorry you missed that part and hope you were able to work something out with your guests. Thank you for staying at Villa Rosa. Just got back from 5 days at Villa Rosa. Our group loved their stay here. We loved waking up to the smell of fresh coffee, fresh fruit, and delicious breakfast every morning prepared by Vanessa and Carlos. They are amazing cooks. Upon our arrival they had guacamole, quesadillas, and margaritas prepared for us! They prepared our lunches and dinners as well. This was so convenient because of the location and the size of our group. We didn't have to worry about getting a taxi and finding a place to eat. The food was always excellent! The house was clean, the rooms were spacious and all the amenities were there. We loved lounging in the private pool every afternoon. The location is close to town and a quick 5 to 10 minute walk gets you to shops, beach, bars, and restaurants! The house is uphill so if you walk make sure to be prepared to sweat! Overall, we would definitely recommend Villa Rosa to anyone! Thank you again Vanessa and Carlos for making the trip relaxing for us. I am glad you enjoyed your stay. Come back again. Southside of Puerto Vallarta,Romantic Zone near Los Muertos Beach. 15 minute walk to the beach. In a residential area on a dead end street. Other villas and bed and breakfasts in the area. Away from noise of bars and nightclubs on south side but close enough to go to them. There are currently 12 condo construction projects going on which also create noise on south side. Villa Rosa is away from all that.